The California General Assembly is considering a bill that would allow Notaries to set their own fees for notarial services. On April 8, 2015, the National Notary Association sent a letter of support for AB 1408 to Assembly sponsor David Hadley, and the Association encourages all Notaries to offer their support for this important legislation. Assembly Bill 1408 would repeal the state’s maximum statutory fee limit of $10, allowing Notaries to decide for themselves how much to charge for each notarial act. California Notaries can write or call their state assembly member using the template letter below this article, or can attend a live hearing of the Assembly Judiciary Committee on AB 1408 in Sacramento on Tuesday, May 12, at 9 a.m. in Capitol Room 4202 to voice support for the bill. 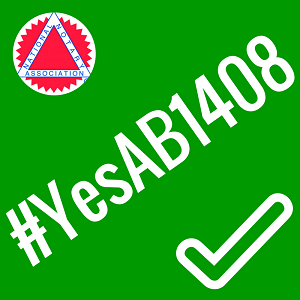 Please let us know how you helped support this bill by emailing us or leaving a comment in one of our social media communities, using “#YesAB1408”. I am a California Notary Public who lives in your district in the city/town of _______________. I am writing to voice my support for AB 1408. AB 1408 will allow Notaries to set their own fees for notarial services. I ask you to support this legislation. The maximum statutory fees for a notarial act have not kept pace with the rising costs to become a Notary and increases in medical, transportation and other living expenses. It’s been 22 years since the fees were raised. But AB 1408 is a much better solution than raising fees because it does away with maximum fees altogether and allows the marketplace to determine what a Notary’s fees should be. I fully support AB 1408. It is about time to change the fee. However a revised fixed fee may be better so that the public may not be unreasonably charged by greedy notaries. I SUPPORT THE IDEA, ESPCIALLY SINCE THE COST OF LIVING HAS RISEN. WHERE THE $10.00 PER SIGNATURE, IS NOT ENOUGH TO COVER EXPENSES TO CONDUCT AND PERFORM ONES BUINESS SERVICES AS A NOTARY PUBLIC. I sent emails to both of my Assembly Members. Please allow notaries to charge the fee's they deserve. Why would I want to support this if there is no example of how my current fees might change? What is the current market price for a Notary who processes a refi, for example? what if the market price drops below what I am currently getting? I will mail out my letter today. I have always felt the fees notaries could charge was absurd considering the liabilities we risk when conducting business. It would be worthwhile to do these acts since some take longer than others. I am pleased to see this bill and have written to both my Assembly Member and Senator in support. I have also shared on my own business facebook page and encouraged other notaries to step up and support this bill. I just wrote to my assemblyman Adrin Nazarian. Thank you for thinking of us. NO NO NO.... C'mon people think about this. Now, on the surface, that seems awesome. But the NNA is packaging with this rather suspicious language: "In a competitive marketplace, the market determines the prices for goods and services. Shouldn’t Notaries be able to do the same?" Okay... here's my issue with this. We don't HAVE to charge $10 a signature. Was can charge less. As it is, most CA notaries doing loan work are not charging anything close to the maximum per signature fee, IMO. This new bill isn't going to help that.... notaries can't get companies to ay now, what will this do? If you have 8 documents needing notarizing with the average married couple on a loan package, that's 16 signatures... and for the NOTARIZATIONS ALONE, by state law, we are allowed to charge up to $160. That doesn't include additional items such as printing, travel, supplies ,etc that are part of our business overhead... and are not even regulated. How many of you are charging $160 - $200 for jobs like this that actually cover your expenses an fall within your profit margin? The assemblyman sponsoring this bill is out of the South Bay of Los Angeles... and while I totally support most of his efforts elsewhere, something here just seems...hinky. Why do I get the feeling this is the result of lobbying to get this to happen by the NNA on cohorts with the signing companies in an effort to "validate" arguments for lower fees? Now, I'm all for eliminating the fee cap...on the surface... but if you think about it, how fair is it to do that? CA has some of the highest allowable fees in the country. Most average (non loan) notary clients nearly have a heart attack when we quote them $10 a signature... can you imagine if we start quoting more? Hey, I'm all for THAT part...we need to be able to cover our expenses and pay the bills. So on that, hey... no problem. The part from their email makes me suspicious, though, is this bit, "In a competitive marketplace, the market determines the prices for goods and services...." Seem to me that it's a way for them to come around with a legal method of supporting the crappy low fees and the old "suggest minimum fee schedule" that they aren't allowed to promote anymore (and yet most signing services and lenders still stick to). They can say, "Hey guys, the market can only sustain so much and you aren't justified in charging X..." Removing the fee cap for signatures isn't going to help notaries AT ALL. Think about it, people. Don't do what the NNA is telling you do to just because they promote it... research the impact of this and seriously consider what this will do. The truth is, it's only going to drive fees DOWN. I support AB 1408 and will write a letter to Assembly Member. Bad idea. CA already has one of the highest maximum fees in the nation, while also allowing a notary to charge less. Making it a free-market concept will not drive fees up, but down. Thank you for asking support for the proposed legislation change. It's about time that we, Notary Publics are acknowledged by creating the appropriate levels of fees for the important work that we do for the public. I would like to see the fees to become a notary reduced, especially for renewing notaries. It's almost $500.00 to renew. Too much for me. May not renew because of the fees. It is about time. thank you, thank you. Absolutely do not support this Bill. If California wants to raise the fee by statute, fine. But definitely not a good idea for a "free for all"
The bill should have a ceiling on the amount of fees charged so that people on low incomes and senior citizens on a fixted incomes can afford to pay the notary charges. While raising fees from $10.00 for each notarial act sounds good. I think this bill needs to set a limit of what the higher amount would be. $12, $15 or what the new amount would increase to. This bill is too vague. For example, when the minimum wage goes up a set higher $ amount is determined. It's not open ended and up to the discretion of the business. I do not support this Bill. If California wants to raise the fee by statute, fine. But definitely not a good idea for a "free for all"
Oh this is a terrible, terrible idea. It is so vague and riddled with ambiguities. While I feel that the state should raise the fee - allowing notaries to charge what they want will probably either drive the price down or result in lost business. What if some enterprising guy (brand new notary) sets up in my little town and undercuts my fee then disappears - how will I be able to charge my standard fee for a notarization once people feel that is is subject to negotiation. Notarization is above all, a standard of trust. I work incredibly hard, and I am diligent and thorough and often spend a great deal of time with a customer just on one signature. I have caught numerous mistakes by Attorneys and Loan Companies, saving my customers time and money on more than one occasion. I also offer complimentary copies of notarized documents. I have created a business that people trust. Allowing free enterprise to invade the honored tradition of notarization will result in older people getting taken advantage of, as well as those with limited English skills. This effort would be better focused on raising the base fee for notarization and possibly lowering the fees involved for someone to obtain their commission. 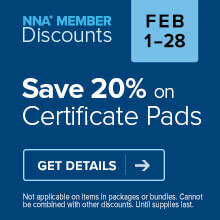 I am appalled that the NNA is support in something like this. Makes me consider my association with the NNA in greater depth....Please think hard about the consequences that this action could have. I SUPPORT THE IDEA, ESPECIALLY SINCE THE COST OF LIVING HAS RISEN. WHERE THE $10.00 PER SIGNATURE, IS NOT ENOUGH TO COVER EXPENSES TO CONDUCT AND PERFORM ONES BUSINESS SERVICES AS A NOTARY PUBLIC.BUT ITS BETTER TO HAVE FIXED PRICE.